Get extra healthy value from every meal. Try adding the diabetes superfoods outlined in this infographic to your plate. 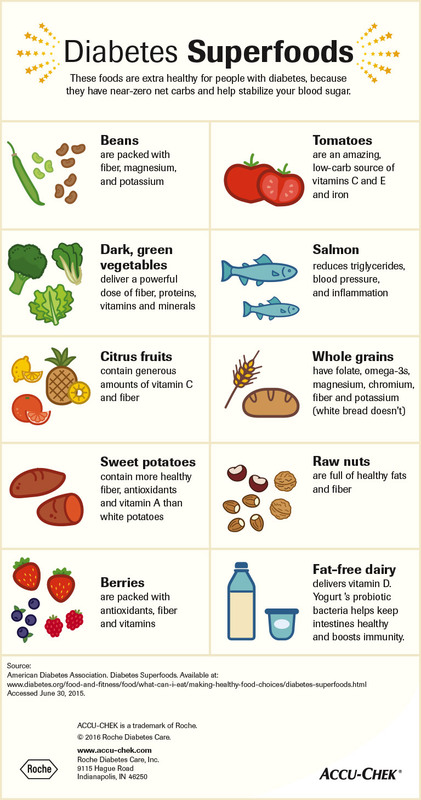 These foods are extra healthy for people with diabetes, because they have near-zero net carbs and help stabilize your blood sugar. Fat-free dairy delivers vitamin D. Yogurt’s probiotic bacteria helps keep intestines healthy and boosts immunity. American Diabetes Association. Diabetes Superfoods. Available at: http://www.diabetes.org/food-and-fitness/food/what-can-i-eat/making-healthy-food-choices/diabetes-superfoods.html. Accessed June 30, 2015.